06 was the first year we actually got serious. We started in a delirious mission in Jan when we noticed a brief warm spell and hit the water in VA hard. We fished 3 days straight. The only fish caught was a twopee on the last day only to meet up with Roger Morgan at the docks to learn that he and his partner had caught a dozen bass a piece. Well, that right there ignited the fire for me and Bass Evans! We felt beat down but inspired. 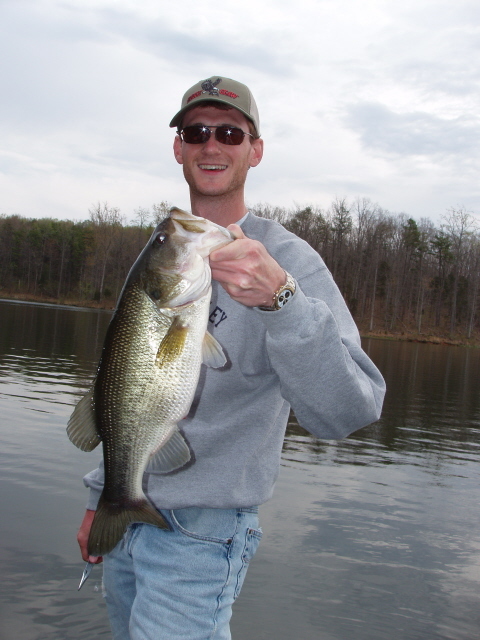 We needed to learn how to become much stronger bass anglers in any season. 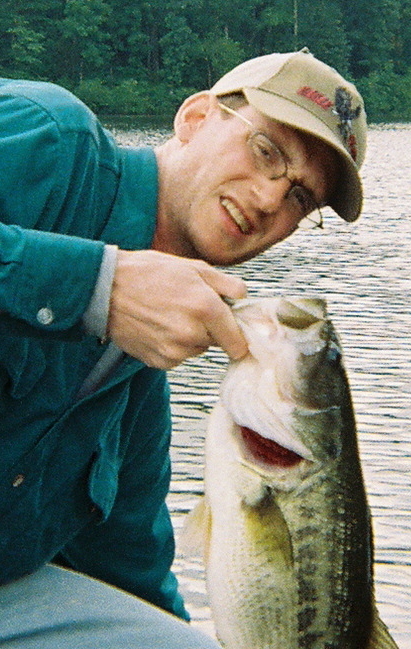 Easter Sunday: I experimented all day with this one rogue jerk bait until finally on a straight retrieve, pow! an estimated 4 pounder. I think that was the only fish caught all day. We blamed that on the spawn. 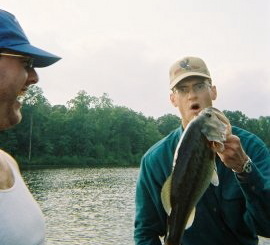 Later that summer, same lake in VA, me, Mop, and Evans fished what we later found out to be the tail end of rains from hurricane Alberto. It rained a warm rain all day until 6pm when the sun just all of a sudden came out. I started flickin blades and slayed! * For whatever reason I was the only one having any real success although we were all throwing relatively the same spinnerbait. I caught mostly 2 and 3 pounders until this 4 pound 4 ounce beauty decided to come along and introduce herself. This was the appetizer we had been working for. Temps had been in the mid to upper nineties and we were dying out there. We decided to hit the water before sunrise. Evansâ€™ spinnerbait barely hit the water and he got nailed by a 3 pounder then immediately after by a 2 pounder. I finally got in the water and pow I got housed and wrapped around a piling by this 4 pound 1 ouncer. Evans noticed the situation amidst the frantic action and assisted with the motor and net rescuing me and the bass. After that, the slay was over. Maybe we spooked â€˜em, but was it ridiculous for about 15 minutes. This was a feeding frenzy that I had only read about. This bass doesn't quite have the adult framework, but her gut was out of control. 2006 was named after me but it was just the beginning for the Heap Hunters. I look back with a lot of fondness at that year not only because I started catching adult bass, but also because I really spent a lot of time working crankbaits and getting the feelÂ with different brandsÂ at different depths . This would be foreshadowing for 2008.